The Renthal TwinRingTM off-road sprocket is, vis-à-vis durability, one of the best investments you could make in your dirtbike or dual sport. The TwinRingTM off-road sprocket combines the light weight of aluminum with the durability of steel. 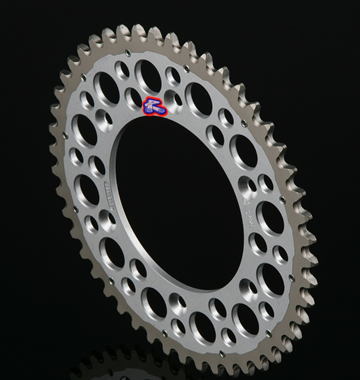 The TwinRingTM sprocket is the ticket for high horsepower, high torque dirtbikes. Renthal claims, in their advertising cack, that the TwinRingTM is the longest lasting, most durable off-road sprocket in all the vastness of the galaxy. We believe 'em. The TwinRingTM sprocket features a nickel-coated steel chainring friction-fitted (the chainring is heated to 2000 C and slipped over the inner ring) to a CNC machined 7075 T6 aluminum inner ring. It's identical in profile to a conventional sprocket so clearance isn't an issue. If our experience is any indication, the TwinRingTM is, as Renthal claims, the longest lasting, most durable off-road sprocket out there (at least in this solar system). It's discernibly lighter than a steel sprocket and its wear characteristics are excellent. It is a bit pricey - especially compared to any of the numerous cheapo brand-x aluminum sprockets blighting the landscape - but quality generally is. Given the exceptional durability of the TwinRingTM it may actually be a better value that less expensive units - ours having outlasted the normal lifespan of several aluminum sprockets. 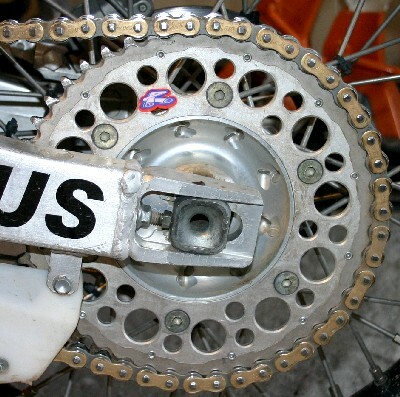 The TwinRingTM sprocket shown in the photo above has over 2000 hard miles on it - extreme cold and heat, rain, snow, mud and sustained high speeds. It was installed several months ago along with a new D.I.D X-Ring chain. Wear is both minimal and even - no shark finning or broken teeth anywhere to be found (the exposed section is representative of the condition of the entire sprocket.